Lorraine Weyker, age 94, a native of Port Washington, WI died August 21, 2017 at Shepherds Inn assisted living in Seymour, Wisconsin. She was born in Port Washington to John and Barbara Prom Karrels on July 30, 1923. 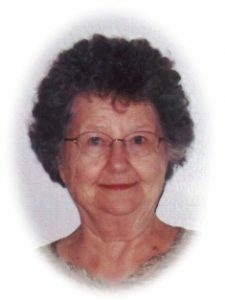 She attended St. Mary’s School at Lake Church in the town of Belgium and graduated from Port Washington High School in 1941. She married Victor Weyker in Montgomery, Alabama in 1943 and traveled throughout the south doing various civil service jobs. The couple returned to County LL in the Town of Port Washington after WWII and raised a family. Her husband preceded her in death July 7, 1995. Lorraine loved to bake and cook, always with extra TLC. In 2000 she moved to the Maple Crest Apartments and enjoyed the many social activities there, including sheepshead. In 2013 she moved to Shepherd’s Inn assisted living in Seymour, Wisconsin to be close to her daughter, grandchildren and great grandchildren. She was proud that her grandmother Helen (nee Lorge) Prom, mother Barbara (nee Prom) Karrels and herself had all lived past 90. She was a proud Green Bay Packer fan. She is survived by a daughter Joyce McCaughn, grandchildren Patrick (Jill) McCaughn and Kerry McCaughn all of Green Bay, WI and great-grandchildren Mason and Maxwell McCaughn. Further survived by brother Franklin (Annabelle) Karrels of Port Washington, sister Janet Becker of Port Washington, sister-in-law Anne Karrels of Saukville, other relatives and friends. Preceded in death by husband Victor, son Daniel Weyker, brothers Wilfrid, Oliver and LeRoy Karrels, and sister Adeline Bolz. The Rev. Patrick Wendt will celebrate a Mass of Christian Burial 7 pm Friday, August 25, 2017 at St. John XXIII Parish, St. Peter of Alcantara Chapel, 1802 N Wisconsin Street, Port Washington. Interment will take place at St. Mary’s Cemetery in Port Washington. Family will receive friend from 5-7PM Friday AT CHURCH prior to the Mass.